Over the past week more and more users have raised question about whether Office 2013 license could be transferred to another. In response to users' concern, Microsoft has confirmed in a blog that Office 2013 software is licensed to one computer for its entire life and cannot be transferred to another PC. The below chart may give you a clear idea. 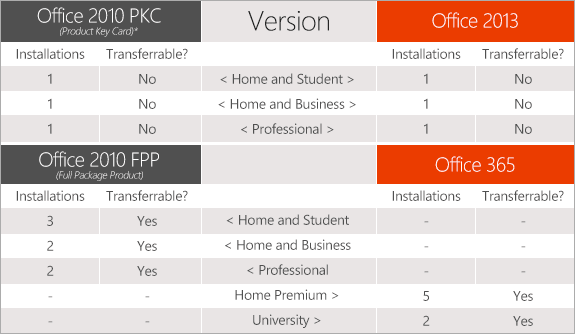 Viewing from this chart, we learn that only retail copies of Office 2010 – also known as Office 2010 FPP (Full Package Product) – allow user to install the productivity suite on multiple computers, which is up to three devices for Office 2010 Home and Student. Everything else from Office 2010 that was preloaded onto new computers to the newest version of Office 2013 has the same installation restrictions. In other words, if you want to install the same Office suite on both your desktop and laptop without forking out extra cash for additional copies, get your hands on a boxed version of Office 2010 now before they sell out. What if your computer just fails to work and you bought a new one instead or reinstalled your operating system? How could you manage to use your Office 2013 then? Jevon Fark from the Microsoft Office team said "an exception is granted when the software is on a PC that is replaced under warranty." It's great that Microsoft will help you out when your relatively new, still-under-warranty computer fails so that you won't have to buy a new copy of Office. However, in our experience, computer parts often fail a year or two after their warranties end. So Microsoft's position on re-installing software on older computers basically confirms what we suspected: you won't be able to reuse your copy of Office 2013 if you ever need to refresh your out-of-warranty system. Budgeting for a new copy of the software for your updated computer is not a bad idea. The blog post further added that: You may not transfer the software to another computer or user. You may transfer the software directly to a third party only as installed on the licensed computer, with the Certificate of Authenticity label and this agreement. Before the transfer, that party must agree that this agreement applies to the transfer and use of the software. You may not retain any copies. Under these terms, you can't even transfer the software to yourself. If you buy a new PC you're expected to buy a brand-new retail copy of Office to go with it, even if you uninstall it from your old machine. Prefer an Office 365 subscription? So what are honest customers supposed to do if they need to use Office on two or more computers, or if they plan to buy new PCs before the next version of Office is released? Anyone who has been following the latest Office launch should already know Redmond's answer to that: those customers should skip the retail version of Office 2013 and get Office 365 subscriptions instead. So, have you made your decision? Upgrading to Office 2013 or going for Office 365, these are the two choices that Microsoft's new purchasing patterns offer us. 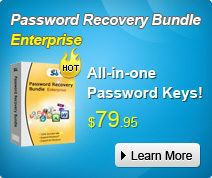 Well, for customers who need to reinstall Office 2013 on their computers but lost Office license somehow, they could feel free to use SmartKey Product Key Recovery to get back the product key.